An efficient way to provide vertical storage space! Cantilever racks are relativity easy to install and can store a variety of materials. They provide greater accessibility and products can be retrieved quickly. This reduces handling times and improves productivity levels. In addition, arms can be added or subtracted at your convenience. They can also be fully customized to best fit your individual needs. 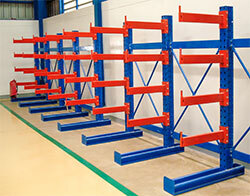 What is a cantilever racking system? 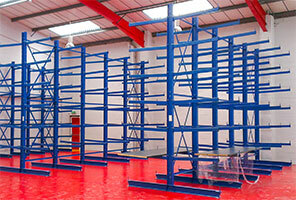 Looking for single or double-sided cantilever racks? You want to consider these few questions before deciding if cantilever racks are the right solution for your warehouse. How tall is your product? How wide is your product? How long is your product? Lastly, where are you going to store your products? Once those questions have been answered and you are ready to speak with vendors, be sure to ask about the following. Strength, Durability, and Safety. Why are these important? Depending on the type of product you are storing, its dimensions and weight. You want to be sure that your racks will hold up and optimize your space. We can customize our cantilevers to best fit your preference and warehouse! Our team believes in providing only the best material that fits your warehouse so your inventory management can be as efficient as possible. Our racks are made of quality US steel. They are also powder coated for durability and come in all colors.